“The task is to make visible the invisible, to expose to public scrutiny the assumptions, values and visions that drive science,” wrote James Wilsdon and Rebecca Willis in “See-through Science: Why public engagement needs to move upstream,” a 2004 publication from the UK think-tank Demos. With the 2012 Public Participation in Scientific Research (PPSR) conference in Portland, and before I head out to catch a couple of talks, I scanned this month’s open-access issue of Frontiers in Ecology and the Environment, devoted to citizen science. We suggest that, in addition to considering social and community benefits, evaluation of citizen-science programs may help foster resilience – i.e. the capacity of a system to absorb shocks yet maintain function (Folke 2006) – in the interconnected ecological and social (socio-ecological) system. 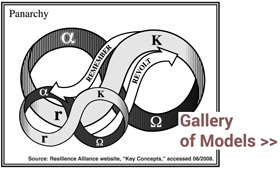 Key to resilience is this collective system’s capacity for learning and adaptation (e.g. understanding how ecological and social systems respond and adapt to climate change and making management choices; Walker et al. 2002). When learning about an ecological system and its associated social institutions (e.g. policies, management practices) through citizen science, a group of individuals gains collective knowledge that increases the capacity of the socio-ecological community to reorganize and adapt to changes. Citizen-science projects may evolve to address both local issues and grand societal challenges. Wireless sensor networks may connect the laboratory to the natural environment, shifting the focus from elite science to a reality where data collection, analysis, and interpretation are performed by everyday citizens going about their daily lives in partnership with professional scientists. A daily bicycle commute could automate air-quality monitoring; gardens could become networked micro-environment monitoring stations; data integration, visualization, and analyses could no longer require difficult file-format conversions; and scientists could more easily integrate continental-scale citizen-science datasets with professional datasets that are augmented by locally relevant citizen observations. For more on citizen science, as related to internet-mediated participation, social learning, and resilience, see this post and comment thread. For the challenges of ecoinformatics, see this post.